That being said, despite not fully immersing myself, I've been lucky to meet some pretty awesome people on some of those platforms! About two years ago I posted on Instagram about taking Christmas cookie orders if anyone was interested... Erin, who had been following me for a while, was the only person who took me up on it. Since she lives in Philly, I told her I'd deliver them in person instead of mailing them. When we met up, we immediately hit it off! Since then, we've hung out a few more times, specifically at the crafty parties she likes to host. 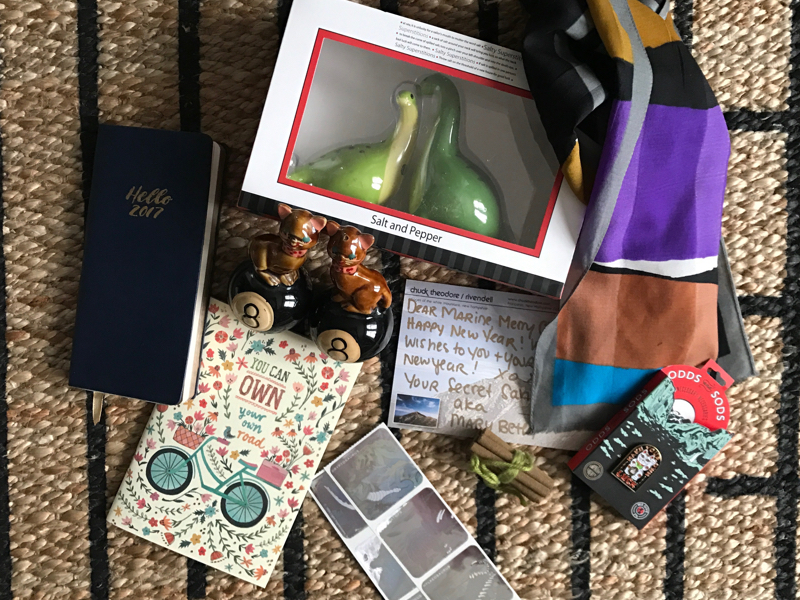 This year, she also invited me to be part of a giant cross-country Secret Santa she hosts! Everyone was asked to post a little blurb about what they like/want for Christmas, and then she randomly assigned everyone a Secret Santa. We had a few weeks to shop, wrap, and mail out our gifts, and we've all been keeping up with the progress and various gifts through Facebook. Now that pretty much all the gifts have been received, I figured it would be okay to post about it. I had a ton of fun doing this, and I really hope she organizes it again next year. If she doesn't, I plan on doing one myself! There's just something so gratifying about curating a gift box for someone - especially someone you've never met! Um, has there ever been anyone more perfect for me to shop for?! Baking, tea, and stationary - yes, please! 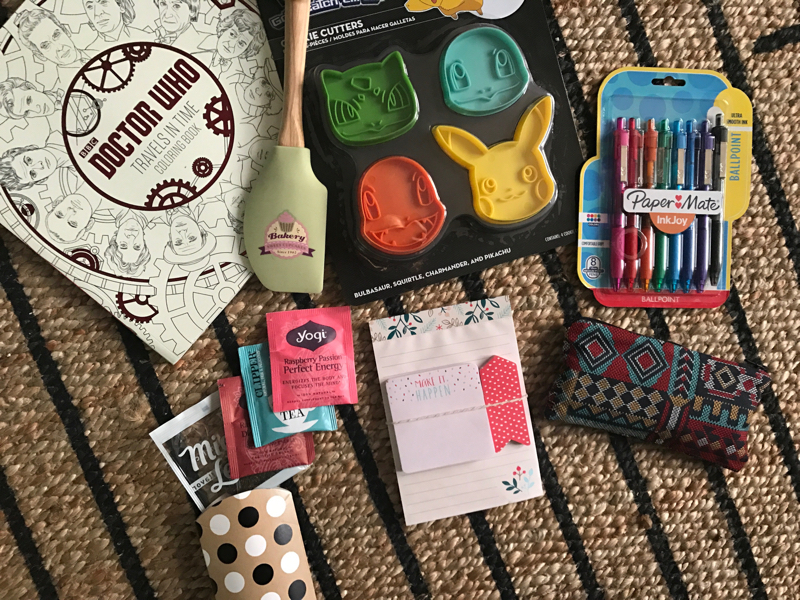 I got her some Pokemon cookie cutters, a rubber spatula, a few of my favorite teas, some notepads, a Doctor Who coloring book, my favorite colorful pens, and I sewed her a pencil case to store the pens in. She loved the cookie cutters! I requested photos for when she finally uses them. 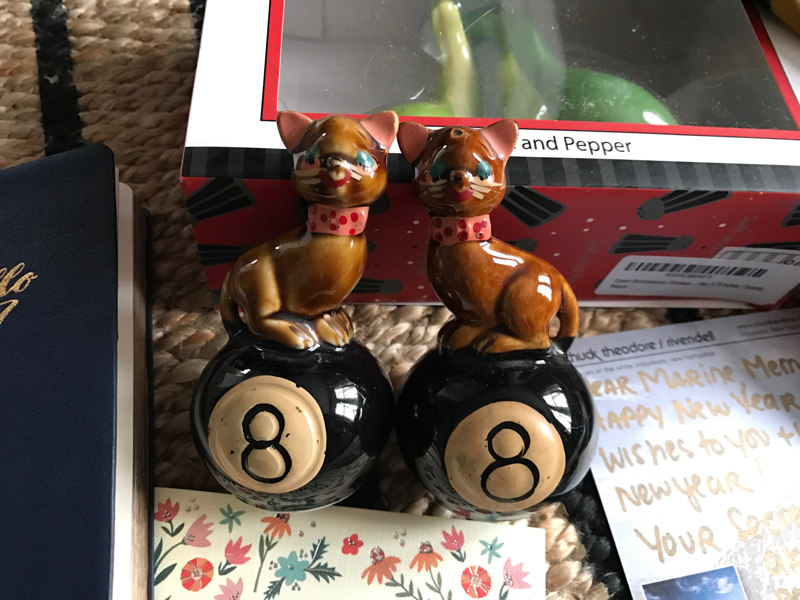 I love cats, dinosaurs, tea, stationary, chocolate, gin, puns, pizza, ridiculous patterns, stickers for my planner, heartfelt words of encouragement, and bohemian inspired jewelry/clothes/housewares. I also collect clocks, and salt & pepper shakers. My gift arrived on Tuesday! She sent me two S&P shaker sets - a vintage cat one from Etsy that she had to dispute when it was never sent, and a set of dinosaurs that she bought after she thought the cat ones would never arrive... the Etsy seller did end up sending the originals after she contacted Etsy, and they arrived on the same day as the dinosaur ones! She also sent me two planners, a lucky cat pin, a pretty scarf, and some really cool holographic dinosaur stickers. Yes! Love it! Have you ever participated in a secret santa? Do you want to? I may attempt to organize a blogger-to-blogger secret santa for next year! Not quite sure how I would go about that yet, but it sounds like fun! This sounds like so much fun! 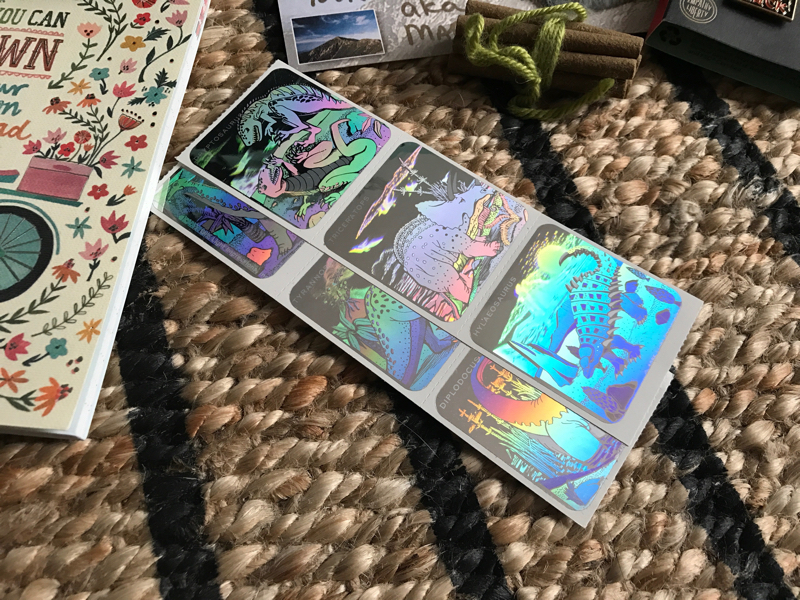 Those dinosaur stickers are incredible!! Right?! I'm not sure what to do with them... want to display them in some way! Aw! Amazing Secret Santa goodies you got! <3 and also sent! In my previous job for the Christmas work dinner they used to organize a Secret Santa (we call it "Invisible friend" in Spain) but it was not as fun as this, because you had 0 feedback from what the other liked, unless you got lucky to get one of your closest mates. Your Christmas sounds so much like ours *wink* Hugs! omg those cat s&p shakers are so cute!! This seems like such a cute Secret Santa too. So thoughtful! It was a really cool thing to be a part of!